Its quite common for an app getting a lot of media attention to become the number one download in a few of the App Stores around the globe. 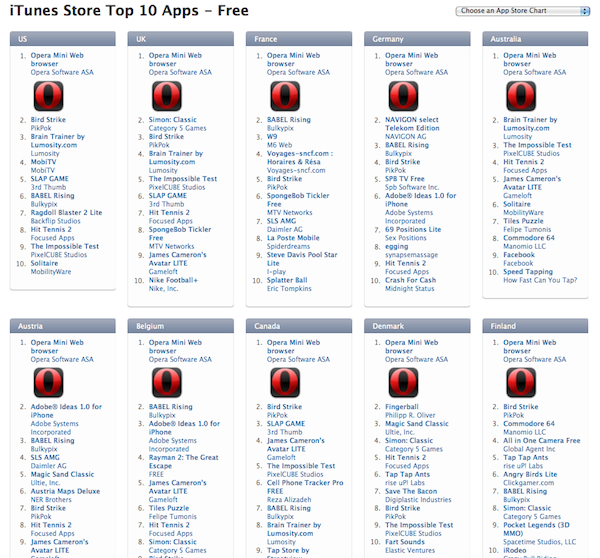 However, it’s not all that common that one app is the number one free download in ALL 22 App Stores at the same time. This is precisely what Opera Mini, Opera’s free browser app for iPhone, iPod touch, and iPad has done (as you can see from the screen shot above). When the Opera Mini browser for iPhone was originally announced, many were skeptical whether or not Apple would even allow the browser in the App Store and allow it to compete with the native Safari browser app. However, since we reported Opera Mini officially being accepted by Apple into the App Store, iPhone, iPod Touch, and iPad users are certainly making it known that they are interested in other browser options on their idevice of choice. Have you had a chance to try any of Opera Mini’s features? Do you prefer it to the iPhone OS native Safari browser? One Response to Opera Mini is the Number One Free Download in Every App Store!